Nick van Owen, the true villain of TLW? As a child, I never considered the character of Nick van Owen to be more than, you know part of Malcolm's crew doing stuff, but eventually I not only understood the animal rights viewpoint, but his Greenpeace type of behaviour as well. So I ask, rather than Ludlow, is he the true villain of TLW? Let's consider the position of Peter Ludlow first. He's head of the company that's trying to make profit and battle against people breaking NDAs. He has no personal feelings towards the dinosaurs one way or another. Technically he is right in saying the animals are private property of InGen, just as stock of cow or reindeer would be to someone. On top of that, they are cloned animals, as well as extinct, and likely patended by InGen. His uncle John Hammond, doesn't have the rights to order company policy anymore. Now, Ludlow heads to Sorna with the intention of re-capturing group of animals that they originally bred in captivity in the first place. Even though the methods of capturing these animals may seem crude to some (and he can't be held responsible for the behaviour of people like Dieter Stark), his intention is just to bring animals alive back to mainland, for zoo setting just like his uncle had planned, although in different circumstances. Technically, there is nothing wrong in what he's doing, apart from ethics towards animals. But once again, we are on thin line here because of the cloned extinct animals aspect. In fact, in Crichton's TLW novel, it's even emphasized by Dodgson how extinct animals would have no rights in animal testing, and thus would be perfect for the job. When his operation at Sorna collapses due to actions of Nick van Owen, what sinister things does Ludlow do for the rest of the film? He was beforehand fine with Ronald's request to shoot the male Rex right? Well he had hardly any way to go around it when they were already at the island and Ronald wanted something in return. So you say next, what about Ludlow's orders to shoot and kill the Rex at the end? Well no offense to anyone, but it is what would have realistically been done by any authority in such situation where large wild carnivore was roaming in urban setting. In fact, the only thing I would argue where Ludlow did show his perhaps darker side, was the seemingly lack of compassion for the loss of life when Ronald tells him of the death of Ajay. Plus of course all the other fatalities. He seemed to be just too enthuastic about the capture of T-Rex at that point, as in putting business ahead tragedy. But then again, we have Nick van Owen putting animals ahead of tragedy. And unlike with Ludlow, whom may just have had put his emotions of grief and remorse aside while dealing with business at hand (plus c'mon he was bit drunk), Nick actually directly works towards creating havoc. We may of course argue with rights or wrongs of animal abuse, but the fact is that the actions of Nick put everyone at the island in danger. I'm sure he doesn't mean anything bad to happen to people on purpose, but still he must understand the risks of his actions! First Nick of course frees the animals InGen has captured, causing the destruction of nearly all the equipment and temporary facilities, plus putting everyone at the camp in danger of getting killed. Now whether or not this was something Hammond had asked him to do or the others in the team agreed with doesn't matter, it was his initiative to perform the sabotage. What exactly did he think was gonna happen in breaking locks of the dinosaur cages? That they were just gonna go their merry ways silently? This is way worse than letting loose some foxes or whatever from farm or warehouse, there are actual people next to these giant dangerous animals. Which he has had the pleasure of knowing for only half a day! Then we have Nick saving juvenile T-Rex. Now this is the one I fault him the least, because he is not directly sabotaging anything, but he is still putting others at risk in his quest to heal the infant. He and to lesser degree Sarah are indirectly responsible for the destruction of their own team's equipment, and death of Eddie as well. Finally we have Nick removing the bullets of Ronald's rifle, in effort to save dinosaur lives. And hence further risking human lives by preventing Ronald not only from protecting himselv, but also others. What, did he think Ronald was still actively hunting for sport on their way to escape the island? At the end, Nick shows absolutely no remorse for any of his actions. Not to destroying the camp (as the fight with Dieter shows), not the infant saving, not the rifle trick. He even mocks Ronald at the copter with the bullets in his hands. So all in all, I do think that Nick is the true villain of the film. While Ludlow was certainly no angel either, and I'm sure both parties knew only too well the consequences of their actions, Nick is the one actually risking everything just to achieve his personal goals. And even though I can understand the viewpoint of believing that animal rights are as important as human lives, well at least to certain degree, that should not mean putting human lives at danger should come as tradeoff for saving animals. That, and the already mentioned cloned extinct animal property aspect. This is interesting. I like that he wanted to rescue animals, but I doubt he was trully interested in that. He even admited he joined greenpeace for women, not to rescue animals. He was like an eco terrorist. His actions put in danger everyone there, including even dinosaurs. I think he was just bolstering/lying about the women thing to justify being in Greenpeace, otherwise he would not have done what he did at the island. Even if Hammond had directly ordered the initial camp sabotage and paid him off with cash bags, the Rex infant + Ronald's bullet removal tells you he really cares about the animals a bit too much and was hazard to everyone. InGen was trying to poach animals off the island, which is pretty illegal. So no, he wasnt. They owned (or had leased the very least) the island. They owned the San Diego "park". How is it "illegal"? How is transporting your own product / life stock between places wrong? Other than maybe ethically, which has nothing to do with legality? The Costa Rican govt can easily come in and go "no, you cant do this". It's the same way how you cant poach animals in Africa. Animals in Africa aren't direct private property of company X, which originally bred them in captivity anyway. Also at the point of the start of TLW there is no indication in film universe that Costa Rica actually knows anything about the dinosaurs, they just lease off the island(s). Maybe if the deleted board room scene had been officially put into canon they would have, but alas since that is (IMO sadly) not the case, there is no indication. But even if they did know everything, why would they not want the island(s) finally cleaned out and the animals moved to States? Maybe they even agreed with InGen in the relocating process, or InGen paid them in order to agree with. All in all, it cannot be said to be illegal process without proof. So they technically wouldn't have rights any normal animal would have. Finally, if we actually believe the Sorna-Nublar dinosaur relocating story Hammond told Malcolm, InGen had already been conducting, or planning to conduct internal dinosaur transportation between places beforehand anyway. In fact, such transportation would have to had been be pretty damn common if most (all?) dinosaurs were supposed to come from Sorna to Nublar in the original plan. This would just be different form of that, years later. But even if they did know everything, why would they not want the island(s) finally cleaned out and the animals moved to States? Because with an island that few people visit, you can hide things better then you can in a big country with a large population. Even if you hide what's going on, you can't hide that something is going on (Area 51). Yeah, but again, why would Costa Rica care? Area 51 is in the control of USA and hiding it benefits the interests of USA, but what does hiding dinosaur island(s) controlled by foreign private company benefit Costa Rica? They would have to have very close relationship with InGen and/or US government to make it beneficial for them, and in that case there wouldn't be reason for them to prevent transportation of animals out of the island either. For arguments sake though, let's say Costa Rica would still be against such moves, even dismissing everything I've said about the properties and cloned extinct aspects and such. Well, the great nature preserver Hammond, now fully out of the InGen board, why doesn't he just inform the CR government of InGen's intentions and thus prevent InGen from conducting their business? You know, rather than have his convoluted plan with Malcolm's gang and Nick's saboteur "solutions"? But we are moving away from the core business I was trying to talk about in this thread. My initial argument had less to do with the InGen/Ludlow side, and more of the opposed Greenpeace spirit. What we have with InGen here, for all purposes is not supposed to harm animals (ethics aside) or humans. Again, sure their methods of capturing might be crude, but they are taking the animals alive nevertheless like for any zoo. And the people participating in the expedition are supposed to be professionals at task. Nick van Oven at the other hand, does not seem to care what the hell happens to humans, as long as he achieves his goal of protecting the animals. And even at that he goes in ham-fisted fashion. This, I think is something that the movie shows in very positive light while making InGen seem stereotypical bad guys. Which I personally believe them not to be. By the way. Let me add one bizarre occurrence that never made any sense to me. When after the Dieter compy attack the group is still having it's pause, Ludlow asks them to raise up and continue the trek to the center of the island. No-one bothers to listen to him, even though they are on his payroll. I mean I guess they could seem him as weak leader, you know instead of Roland, but that's not the weird part. It's when Nick asks them to raise, everyone does. Why exactly? Have they not been informed that it was because of this guy everything went to crap? Most of them were even around when accusations towards him and the others fell. Some of these InGen men should've hold grudge against the man who most likely doomed them to grave, or at the very least not see him as some sort of new leader figure. It makes absolutely no sense. It's a really missed opportunity from the movie to not show that both sides can be bad. Instead, they try to make Nick look like the 'cool' guy everyone now respects for some reason. You know, I don't disagree. Nick Van Owen actually kind of a jackass right from the start; I’d even argue he was never meant to be a Harrison Ford type badass, but a foil to Roland Tembo. He's an environmentalist who is shown to be arrogant, aloof and is clearly in it for the money. While Sarah's incompetence annoyed me, Nick’' actions put him in greater contrast with the honourable character of Roland. In fact it's kinda tempting to imagine the film as having an anti-activist message considering how reckless Nick is and how the old fashioned Allan Quatermain inspired hunter is not the bad guy he's initially made out to be. If he was hired as a a tracker rather than a hunter for Hammond's team, he could have whipped them into shape. With all that said, I still don't find the InGen team more likeable on the whole. The dinosaurs might be their property but they have their own established environment that should be studied and documented professionally (though with Nick around, it was clear that Hammond was really going cheap at this point). Their handling of the dinosaurs was to the point of abusive. I know we've covered the fact that they are basically company property and don't have the rights that modern animals have, but every time they are treated as property to be dispensed with in this franchise, it goes badly for both parties. As much as I don't like Nick, Ludlow's ambitions were a complete mess and would have endangered more lives in the long run. For arguments sake though, let's say Costa Rica would still be against such moves, even dismissing everything I've said about the properties and cloned extinct aspects and such. Well, the great nature preserver Hammond, now fully out of the InGen board, why doesn't he just inform the CA government of InGen's intentions and thus prevent InGen from conducting their business? You know, rather than have his convoluted plan with Malcolm's gang and Nick's saboteur "solutions"? By the way. Let me add one bizarre occurrence that never made any sense to me. When after the Dieter compy attack the group is still having it's pause, Ludlow asks them to raise up and continue the trek to the center of the island. No-one bothers to listen to him, even though they are on his payroll. I mean I guess they could seem him as weak leader, you know instead of Roland, but that's not the weird part. It's when Nick asks them to raise, everyone does. Why exactly? Have they not been informed that it was because of this guy everything went to crap? Some of these men should've hold grudge against the man who most likely doomed them to grave, or at the very least not see him as some sort of new leader figure. It makes absolutely no sense. It's a really missed opportunity from the movie to not show that both sides can be bad. Instead, they try to make Nick look like the 'cool' guy everyone now respects for some reason. The only reason I can think of is because Hammond didn't want the world to know about the mess that happened at the old park. And if the Costa Rican government knew, they'd tell the American government, and even back then, people were still wary of Uncle Sam. As for Nick, I think he had the anti-human mindset because of how he was sick of endangered species being wiped out. Even today, you see this. Surely you heard of how the one rhino in Paris was kill because of its horn? Haven't you encountered people who, upon reading/seeing that, only shook their heads in disgust and lost a large part of humanity because of that? I think that was what Nick was supposed to be. That and Hammond was against his company basically making the same mistake that he did. As for people listening to Nick instead of Ludlow, Ludlow basically gave all, if not, most of his power to Roland during the game trail hunt. I do not think the San Diego park plans were brilliantly thought out (not that the other parks were either), but I think Ludlow wasn't really recklessly greedy or messy, and rather honestly just trying to save the asses in the company. Hammond's line in the film: "We've been on the verge of chapter 11 ever since that accident in the park. There are those in the company who wanted to exploit site B in order to bail us out. They've been planning it for years, and I've been able to stop them until now" I think enforces this thought, as does his anger towards Malcolm breaking NDAs. If the company would have gone bankrupt without their intervention, what then? Now, were the methods of capturing animals harsh? Yes, admittedly, but dealing with animals left to their own devices for 4 years pretty much guaranteed that needed to happen. I don't think there's clean way of doing it if you are committed to it. And we have to remember, at this point it's plausible that the only way to get dinosaurs to the new park is via this way, and that the old technology was either lost or extremely hard to reinstate with the destruction of the old facilities. At least, with the InGen financial situation demanding change + no-one knowing about the fate of the first park + relatively modest plan of the San Diego park, it all seemed realistic to me within the film universe... unlike Jurassic World. That still doesn't explain why would the InGen hunters care what Nick said, especially after destroying the camp. I know why Nick did what he did, but that doesn't mean what he did was right. 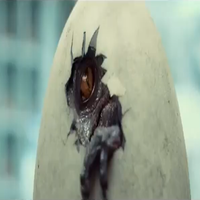 Remember the lines Grant had to say about Billy when he found about the eggs in JP3? Good intentions... but Billy in comparison was a saint. Because when somebody that's supposed to be a leader is so weak, unpopular,has too much baggage, or has all 3, people will listen, or at least consider doing so, to anybody else who talks tough. Donald Trump, anybody? That seems a bit weird analogy, I don't buy it. I've always seen InGen as the villains. The dinosaurs may have been cloned, but they were wild animals and they deserved the same kind of respect that you'd show to any other wild animal. Say, for example, you're hiking in the forest and you see a bear. What do you do? Would you go running up to the bear or would you have enough common sense to give the animal a bit of space and stay at a safe distance? Remember the scene with the Stegosaurus herd? We all saw what happened when Sarah got too close to the baby. The adults saw her as being a threat to their infant and became very defensive. That would have been a normal thing for them to do. The tail spikes weren't there for decoration, they were weapons that could quite easily cause a fatal injury. These animals may have been herbivores but that doesn't mean that they were always gentle and friendly. They only became wild animals after the cages were gone though. They might have had the instincts of their ancestors, but if you live from birth to adulthood in captivity it can be difficult to adapt to the new environment. That's why animals often freed from zoos cope poorly or die. And you people ask why they were harsh in the capturing? Minmi just said it. These are dangerous animals that can defend themselves, you can't just go nanny way with them if you want your hunters to survive unharmed. If you are committed to the task of capturing, you need to do it properly. The rest is ethics. I guess the question is better this way: Why is InGen evil for (re-)capturing the dinosaurs at Sorna 4 years later, but Masrani supposedly not for doing the same exact thing at Nublar years later? Why aren't they considered evil greedy villains? And why wasn't Nick van Saboteur, or his Greenpeace friends there that time to put vocal end to it? They all knew the island existed, but I guess it didn't matter anymore? Just have the new park built anyway and we watch by the side? That is one of the true faults of Jurassic World. Ignoring the past and only showing one sided response to the park. Even if TLW wasn't necessarily great at portraying objective perspective of Nick's actions versus InGen, at least the "voice of resistance" was there in some form. For JW it didn't have to be animal rights aspect again just for the sake of it (and god forbid it doesn't have to be again for JP5) but with especially the happenings of San Diego in memory, there needed to be some form of rebellion portrayed, so that it didn't seem like one sided deal. Now it was a cartoon park. This is one of the things I love about TLW: the lack of clear cut antagonist vs protagonist. It makes the movie more interesting when humans act like humans, and not some condensed characterization. Subject: Re: Nick van Owen, the true villain of TLW?